Physical Education Department of Xi’an University of Post and Telecommunications, Xi’an 710121, China. 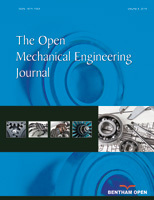 This paper proposed a three-dimensional model of treadmill, structural diagram of mechanical transmission, structural optimization model and kinematic analysis model, deriving the values of connecting rods as 0.425 m, 1.673 m and 0.662 m by solving the optimization model. It further conducts a kinematic analysis on treadmill using this set of parameters and kinematic simulation software “Motion”, providing simulation curves of angular displacement, angular velocity and angular acceleration of the main moving parts such as the connecting rods, pedals and handrail handles. The simulation curves indicate that when the rotation speed of the wheels is 10 r/min, the connecting rods, pedals and handrail handles move smoothly and change almost sinusoidally; the displacement of handles ranges in-700∼200 mm, the speed ranges in-400∼400 mm/s, the acceleration ranges in -400∼500 mm/s2, the angular change of pedals is -5°∼30°, the amplitude variation of angular velocity is <25°/s and the amplitude variation of angular acceleration is <28°/s2. The above mentioned calculated prospects of the treadmill provide some reference for carrying out a quick optimization design of the treadmill.